June 1st was a sunny Sunday in the Swiss-German land, and seemed like the perfect day to begin my return to the mountain environment. On another sunny day in April, the 28th to be exact, I’d sweated through my dissertation defense, and after jumping from Zurich to Amsterdam, to Zurich to New Orleans to Detroit, to Boston, to Detroit, and finally back to Zurich, I found myself unemployed and in need of a mountain tour. 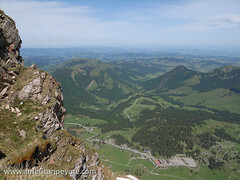 So on a sunny Sunday, the first of June, I headed out for a tour up Santis, the iconic mountain massif floating in the green landscape of Appenzeller, the heart of Swiss-German speaking peoples in Switzerland. 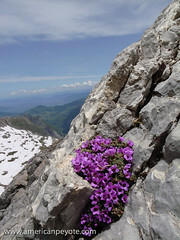 Santis is one of those mountains that people grow up with, starting with hikes as children and continue into old age. This was something like my 5th trip up the mountain, and the first early summer ascent. It was also an introductory trip for Matt Anderson, the Seattle mountain guide-turned Zurich-based commercial photographer. I’ve photographed Santis in Summer and Winter, blanketed in snow and covered in wildflowers. However, I’ve long since grown bored with basic landscape shots, the type perfected on postcards sold all over Zurich. So to make the trip more interesting I packed along some off-camera lighting gear. The essential problem with mountaineering and photography is the weight trade-off. In the Swiss Alps every once counts, and as your desire to include cameras, flashes, and light modifiers goes up, your physical mobility in the mountains decreases. A normal hike in the Swiss hills generally means a minimum elevation gain of 1000m, and by the time you finish the tour, the elevation gain over summits and passes adds up pretty fast. So, in principle it’s ill advised to take more than a DSLR and a lens or two. My photo and lighting kit included a Fuji GA645wi, a Ricoh GR Digital, Sunpak 383 flash and Gadget Infinity radio trigger. The Ricoh GRD has proven itself many times as more than capable with it comes to off-camera, or Strobist flash techniques. Choosing the Ricoh dramatically minimized the weight penalty as compared with packing my Minolta 7D DSLR with a macro lens. The Fuji was used for basic landscape shots. Off-camera lighting on a mountain side isn’t so easy. After you’ve ascended 1000m the body is shaking a bit, and when you’re on a rock ridge, it’s not like there’s any place to set up light stands. I put a Gadget Infinity radio trigger on the Ricoh GR and held the Sunpak 383 at arms length from above the wildflowers growing on the mountain ridge. In a few minutes and a little exposure management I could balance the landscape exposure with the flash lighting the flowers. Wham! Bahm! And there we have a mountain photo I haven’t seen in the postcard stand. 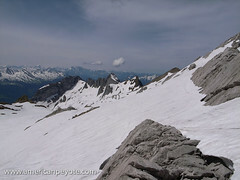 In early June there are few people making the ascent up Santis, mainly due to the snow, which covers most of the Alpine route. Many people will ascend with nothing in the way of mountaineering equipment, but I recommend taking crampons and an axe, because slipping on an exposed snow-covered 50 degree slope on a Sunny June Sunday is probably as stupid and just as deadly as putting a bullet in your brain. Santis is a tamed mountain. There’s a weather station at the summit and Steinbock have long since lost any fright-or-flight instinct. The animals roam the Santis as they like and have no fear of humans, which means it’s pretty easy to make some of those iconic mountain wildlife shots. 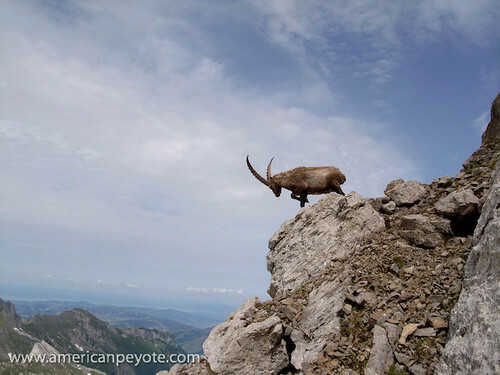 Well, the Steinbock have one predator – avalanches. 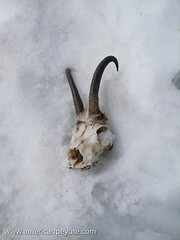 And if you climb up Santis in early Summer don’t be surprised to find a decayed carcass or skull in the snow. 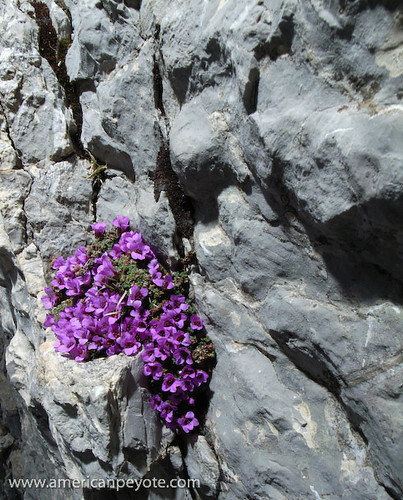 Wow, another best part of mountaineering – the heavens and pristine rocks! You captured everything perfectly. Your DSLR is probably your most trusty climbing buddy!